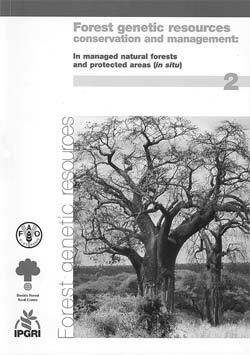 Forest genetic resources conservation and management, Vol. 2, In managed natural forests and protected areas (in situ). FAO, DFSC, & IPGRI. 2001. Rome, International Plant Genetic Resources Institute. ISBN 92-9043-472-4.
provide examples of genetic conservation, at the national, regional and international levels, reported from partner institutions around the world. The second volume provides practical guidance to in situ conservation strategies and methodologies for forest (tree and shrub) genetic resources. It is primarily intended for planners, decision-makers and professionals involved in conservation and management activities at the field level. Through examples and case studies, the guide seeks to illustrate the differences and similarities of ecosystem conservation and conservation in situ of genetic variation within and between species targeted for conservation; the compatibility of conservation and sound resource utilization; and the long- and short-term benefits of genetic conservation. “Protected areas and their role in the conservation of forest genetic resources”, which discusses the importance of protected areas in this regard. A final chapter summarizes experiences and future prospects based on the information provided in the early chapters. It is hoped that these guides, based on a combination of current theoretical knowledge and recent practical experience, will help improve understanding of the options available for the management of forest genetic resources and further the implementation of conservation activities at both operational and policy levels. 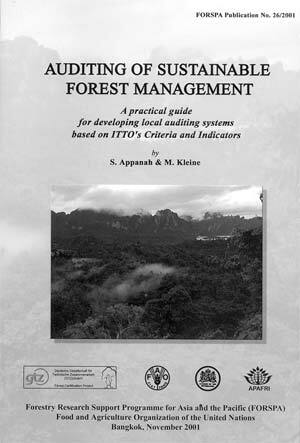 Auditing of sustainable forest management – a practical guide for developing local auditing systems based on ITTO’s criteria and indicators. S. Appanah and M. Kleine. FORSPA Publication No. 26. 2001. Bangkok, Thailand, FAO Regional Office for Asia and the Pacific. A new and significant development is taking place in forest management: the marketplace is beginning to influence the way forests are managed. Buyers of forest products are beginning to look for a guarantee that their purchases come from a well-managed forest (e.g. a forest certified through an independent verification process). Following international agreement on the so-called “Forest Principles” at the United Nations Conference on Environment and Development (UNCED) in Rio de Janeiro, Brazil, in 1992, there has been a plethora of initiatives to establish specific principles for forest management, to identify criteria to assess the quality of management and to identify indicators to assess performance. Certification systems to document that forests are well managed are now being promoted in many areas of the world. Despite the many new initiatives, the extent of forests that has been certified as sustainably managed in the Asia and the Pacific Region remains insignificant, as a result of many factors. First, few institutions in the region have sufficient knowledge about certification procedures, opportunities and benefits or about how their management procedures would have to be upgraded to obtain certification. Second, most countries in the region lack the expertise needed to train their field staff in the procedures and auditing systems. Third, few documents offer the means and methods for implementing criteria and indicators at the forest management unit level. Nor do most forest managers know how to go about auditing their own efforts. This publication of the Forestry Research Support Programme for Asia and Pacific (FORSPA) is an attempt to bridge some of these gaps. It is a highly practical guide presenting clear and simple auditing approaches. The guide can assist national and/or regional institutes in developing local auditing systems. Its main innovation is a weighting system for the various criteria and activities which makes it possible to identify those that accord the highest benefits in terms of sustainability and that should receive maximum attention from forest managers and auditors. 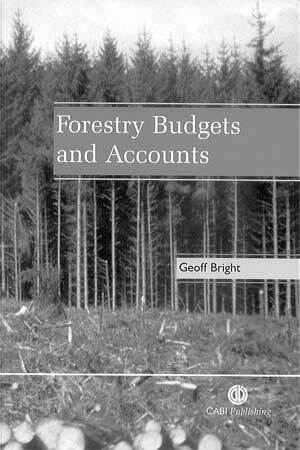 Forestry budgets and accounts. G. Bright. 2001. Wallingford, UK, CABI Publishing. ISBN 0-85199-328-1. Many students and professionals in the field of forestry must deal to some extent with financial planning, control and evaluation. Areas of management with which foresters are concerned such as silviculture and technical aspects, marketing and staffing all have a relation with financial management. This book aims to provide the student and practitioner with an understanding of and an ability to use the tools of financial management in a forestry context. This book seeks to help those involved in the management of forests become more comfortable with the accounting side of their role. It is set out in a clear, approachable and structured way. Understanding builds as the reader is led through a series of steps on profit, cash and capital, recording, accounts construction and appraisal, evaluation of alternative investments, information technology and tax. The book is intended for a global audience; the principles discussed and examples used are universally applicable. Appendices relate the content to the particular contexts of the United States, Australia and New Zealand. The book will be valuable not only for students and forestry practitioners, but also for managers and owners of all types of forests, surveyors, accountants and advisers. Group certification for forests: a practical guide. R. Nussbaum. 2002. Oxford, UK, ProForest. Forest certification is a process by which the performance of the field practices and management systems of forestry operations is assessed against a predetermined set of standards. It can be a useful tool for promoting sustainable forest management. Group certification aims to bring together small forest areas under a single manager who organizes the certification process and provides the requisite information. Such collective efforts can provide numerous benefits to smallholders. This guide provides practical advice to anyone wanting to set up a group certification scheme. It describes the activities necessary to support and involve members, particularly by keeping them informed about membership rules, group requirements and procedures. In a chapter about the chain of custody, it discusses the need for ensuring the traceability of wood produced by group members, an essential requirement if the wood is to be sold as “certified”. Finally, it describes the steps in the certification process and explains how group managers go about getting a group certified. The Forest Stewardship Council’s Principles and Criteria for Forest Management, which serve as a global foundation for the development of region-specific forest management standards, is presented in the Appendix. 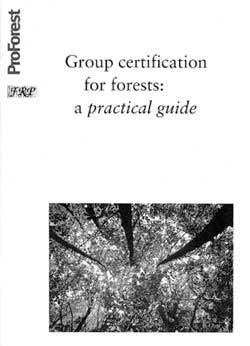 This practical guide is also available electronically on the ProForest Web site at www.ProForest.net. 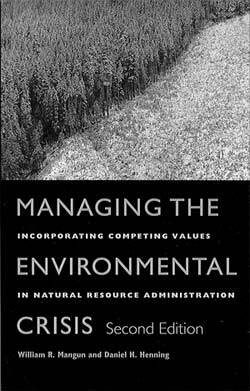 Managing the environmental crisis: incorporating competing values in natural resource administration. W.R. Mangun & D.H. Henning. 1999. Durham, North Carolina, USA, Duke University Press. ISBN 0-8223-2413-X. 2nd edition. Managing the environmental crisis provides a balanced and comprehensive guide to the management of complex environmental and natural resource policy issues. It considers the roles of both governmental and non-governmental organizations in the formulation and implementation of national and global environmental policy. The book reviews a range of environmental policy concerns, including energy considerations, renewable and non-renewable resource management, pollution control, wilderness management, and urban and regional policy. It discusses the history of these concerns, recent actions, continuing problems and the consequences of failure to address them. The chapter on renewable resource management includes a specific focus on forest policy and forest health, as well as sections on policies for range management, water and wildlife. Beyond the focus on specific political issues, Mangun and Henning direct their attention to two large-scale trends: globalization and the political polarization of the environmental movement. At the level of the decision-making process, the incorporation of values – specifically addressed from multicultural and cross-disciplinary perspectives – is also discussed. The authors open with the often-overlooked fact that it is human action, not the environment, that needs to be managed. devolution of responsibility from the national to subnational level. It discusses various successes in environmental cooperation and management strategy while pointing to the new challenges that have emerged in the past decade. The book is intended to appeal to persons with a wide variety of interests in environmental affairs. Individuals from both industrialized and less developed countries, as well as those in international organizations, should find the approaches to decision-making useful. The interdisciplinary orientation of the book should make it a valuable text in several academic and professional fields, including public administration, political science, environmental studies and natural resource areas.